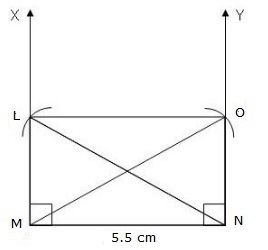 Construct a rectangle LMNO in which MN = 5.5 cm and diagonal is 8.5 cm. Write the steps of construction. In a rectangle both the diagonals are equal, so we have LN = MO = 8.5 cm and each angle is 90°. So M = N = 90°. b)Draw XMN = 90° and YNM = 90°. c)With N as centre and radius 8.5cm draw an arc to cut MX at L.
d)With M as centre and radius 8.5cm, draw an arc to cut NY at O.
LMNO is the required rectangle.